Orbital Sciences Corp. rolled out its Antares rocket and Cygnus spacecraft to the Mid-Atlantic Regional Spaceport Pad-0A at NASA's Wallops Flight Facility in Virginia on Sept. 13, 2013. Antares is scheduled to launch Cygnus on its maiden flight to the International Space Station on Sept. 18. A commercial cargo capsule has been cleared for its debut flight on Wednesday (Sept. 18), a liftoff that will blast the robotic vessel on a demonstration mission to the International Space Station. The unmanned Cygnus spacecraft, which is built by aerospace firm Orbital Sciences, passed its launch readiness review and is now set to lift off Wednesday from NASA's Wallops Flight Facility in Virginia, officials announced Monday (Sept. 16). Cygnus will blast off atop Orbital's Antares rocket, which flew to space for the first time this past April. 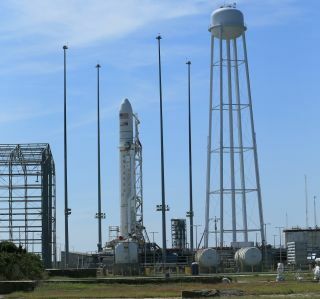 Wednesday's launch is a test to see if the Virginia-based company is ready to start making a series of eight cargo runs to the space station for NASA under a $1.9 billion contract. The liftoff was orginally scheduled to take place Tuesday (Sept. 17). However, a faulty communications link between ground equipment and Antares' flight computer interrupted a key review called the combined systems test (CST) on Friday (Sept. 13), pushing everything back a day. The problem was fixed and the CST was completed late Saturday night (Sept. 14), Orbital officials wrote in a status update over the weekend. After launching to orbit Wednesday, Cygnus will spend four days chasing the space station down, eventually arriving on Sept. 22. Astronauts aboard the orbiting lab will then unload about 1,300 pounds (589 kilograms) of cargo from Cygnus, which is designed to carry up to 5,952 pounds (2,700 kg) of supplies in its enhanced configuration. Cygnus will spend about a month attached to the space station, at which point it will depart and burn up in Earth's atmosphere. Orbital Sciences isn't the only company that holds a NASA cargo contract. California-based SpaceX signed a $1.6 billion dollar deal to make 12 flights to the space station using its Dragon capsule — which, unlike Cygnus, can return hardware and equipment to Earth — and Falcon 9 rocket. Dragon has visited the orbiting lab three times, once on a demonstration mission like the one Orbital is launching this week and the other two times on bona fide supply runs. You can watch the Cygnus spacecraft launch live on SPACE.com Wednesday, courtesy of NASA TV. NASA will also hold a press conference on Tuesday, Sept. 17, at 2 p.m. EDT (1800 GMT) to discuss the mission.